The time has come! The results are in for the first annual Strange Music MVP Awards 2011. For one week, we gave you the power to vote on your favorites from the past year in some of the biggest categories around – “MVP Of The Year”, “Who’s Next? !”, “Most Wanted”, and “Verse Of The Year”. Capturing the absolute best Strange Music had to offer in 2011, we rolled out 12 official categories to vote on. You chose and for many of the nominees, it came down to the wire. Kutt Calhoun and Brotha Lynch Hung battled it out for MVP Of The Year while 2011’s Most Wanted category set Twitter on fire. Who came out on top? Who received top honors for the first annual Strange Music MVP Awards? You let your voice be heard and now the results are official! Strange Music MVP Awards 2011: Who’s Next?! 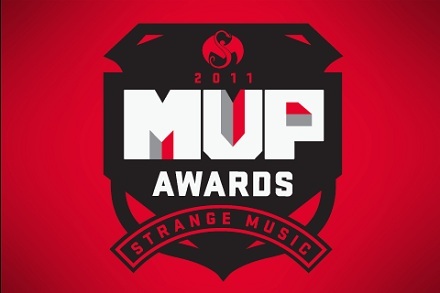 Congratulations to the winners of the 2011 Strange Music MVP Awards!